This is my studio. 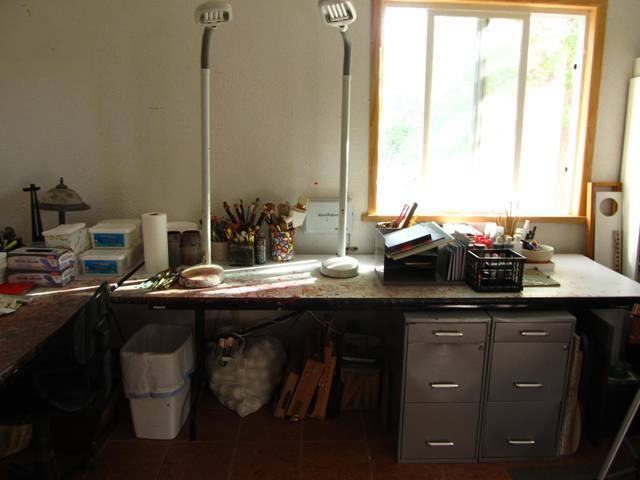 In this photo you can see my computer, the French door that leads to the back yard, my painting area, gloves, tissue, wipees, etc. On the left are solvents, brush cleaning equipment, pens, a big stack of blank index cards (my lifeline for remembering things), and a metal rack for important incoming paperwork. On the bottom under the table I have three big containers of ornaments just waiting to be painted. I also have "clean" canvases - which are white and need to be covered as soon as possible. In the upper left, I have a bulletin board with family photos, drawing from my girls, feathers I have found, etc. The cabinet houses all of my cd collection and the pups' leashes are hanging on the wall. I just realized that I need some kind of cool container to house all of the oil paint tubes I seem to be collecting. 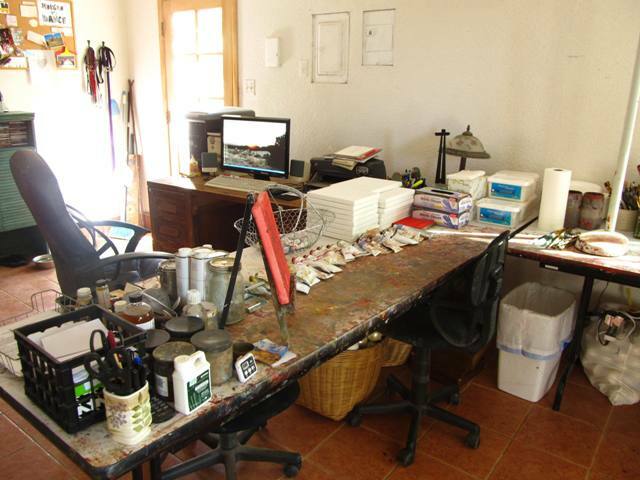 Usually when I say "clean my studio" it means that I just kind of clean off the tables and shuffle the clutter around. This time, I really cleaned. I'm not done yet, but almost. I have to get some single edged blades to scrape acrylic paint off the floor and mop one half, clean the windows and doors and then I'm done. After that, I will decide whether I want to paint or not. This is the other table with my two filing cabinets (the next thing to be organized) my plein air easels under the table, my two spectrum lamps for extra lighting, all of my brushes, and a little area for filing and acrylic materials. This is the area that I really cleaned. 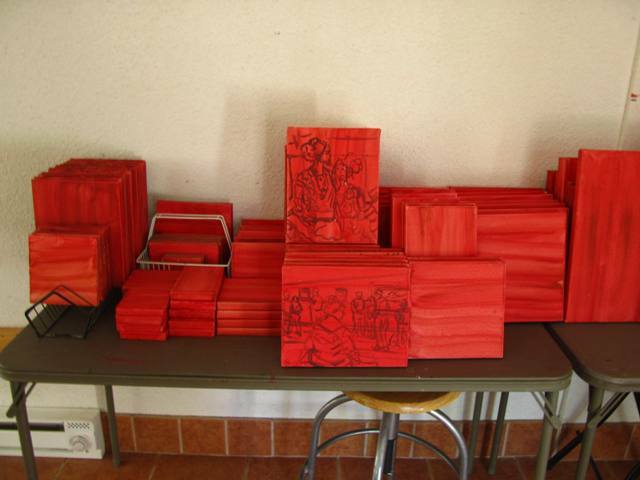 There were about 10 of bins of acrylic paint, a large dark brown three panel hinged screen, some old canvas, an old slide light box, and lots of little junk (some sun faces I bought to paint but never did, some statues, some old books, etc). I have to still label and organize all of those white boxes that hold things for hanging, postcards, camera bettery chargers, you name it and it's probably in one of those boxes. 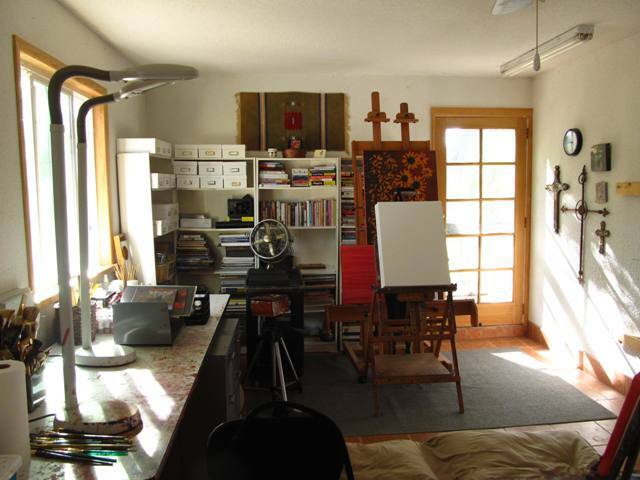 You can see my two larger easels and my favorite cigar box easel on the tripod. In the back is my favorite studio item - the black roll around cart that holds all of my photos and reference material, plus afan that looks very vintage but is actually new and modern. This is the area for my small canvases. I have all of the canvas for daily painting and gallery wrap canvas for Weems Artfest. There are also some small "mini" canvases (4x4, 4x5) that I will be painting for Artfest this year. I also have two extra stools stored underneath for when people come and hang out. Another view. You can see the doggies' beds (which I remove every morning) and my little studio cross collection. And a clock. Of course. I put it WAY over there so I would forget to look at it. I hate clocks. On the far right you will notice part of a wall that has 2x4s laid out for holding completed paintings. The French door leads out to the side courtyard. I think I've almost given you a 360 degree view of the studio, now I just need to get to work! 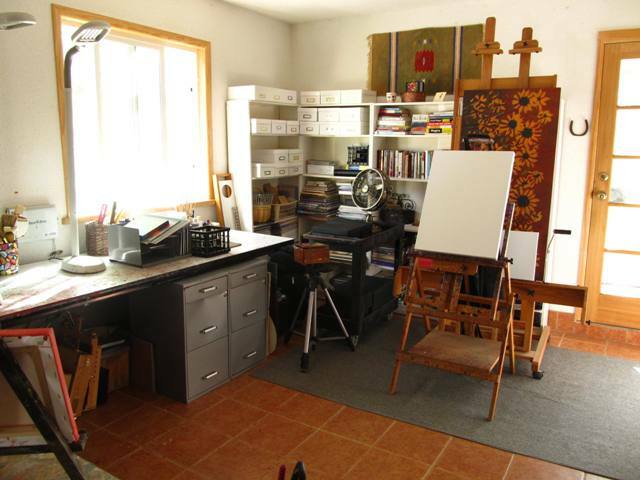 I love to see other people's work areas - you are so tidy! It looks like a wonderful place and I love your cross collection! I love your wall of crosses too. I've started a small collection. My new "thing" is the Virgin Mary and Our Lady of Guadalupe. I'm not even Catholic, but I'm soooo drawn to their icons. I even hooked a rug of Mary and made it into a triptych!!! 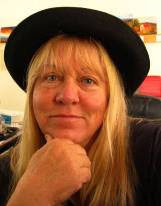 Thanks again for sharing your beautiful art with the world. As soon as I can decide on my fav, I'll own one too.